As a proactive measure, the NIST has recommended that organizations eliminate 1024-bit RSA certificates in favor of stronger keys. But managing certificates during a size migration is not easy – and any resulting production outages could have a negative impact on your business. 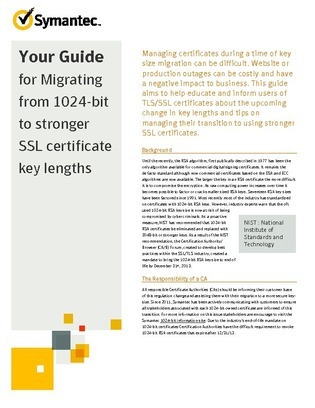 If you are a user of TLS/SSL certificates, read this guide to understand the upcoming change in key lengths and find tips for managing your transition to using stronger certificates.